Colchicaceae - colchicum family Monocot. The beautiful, impressive, delicate flowers of Colchicum bivonae appear in autumn after the first rains. The translucent white tepals are chequered with pale purple surround 6 bright yellow stamens, and 3 curved white styles. The tepals fuse to form a white tube, which emerges directly from the earth. The leaves do not appear until spring. Members of the lily family, colchicums are not true crocuses, differing in a number of botanical details most obviously having six stamens; crocuses have three. All members of the Colchicum family produce a substance, colchicine, which although in sufficient dose is highly poisonous, is still considered an effective treatment for the painful condition, gout. 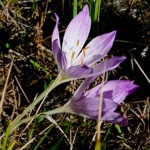 Colchicum from Colchis (Κολχίς), on the shores of the Black Sea, South of the Caucuses mountains. The land of the Golden Fleece of Greek mythology.